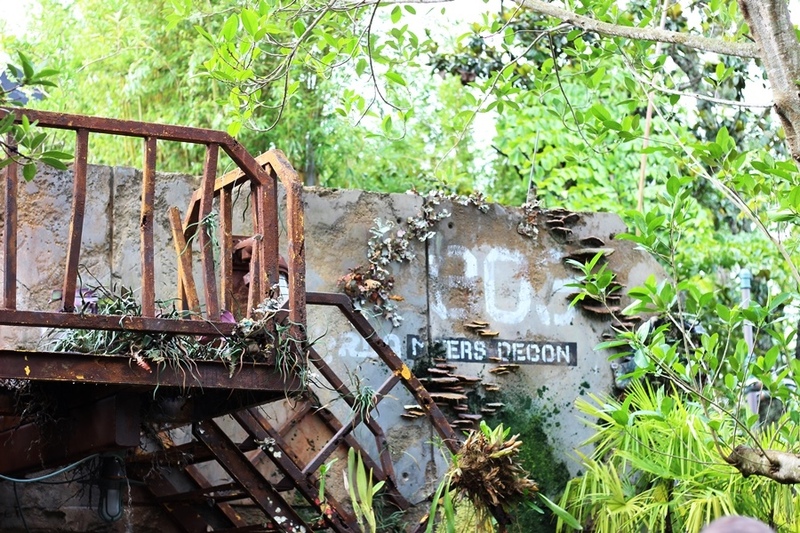 There is a line of thought present in Pandora that can be traced all the way back to the earliest days of design for Disney’s Animal Kingdom. Its roots are in the idea that once you have a theme for the park, all decisions have to adhere to that principle. In other words, if the park is going to be dedicated to the intrinsic value of nature then everything has to embody that idea. There are many examples of this throughout the park, and in Pandora itself, but I want to talk about just how far you can take that rationale and make it stick while mingling in story and landscape. To do that we’re going to just about the last place you would think of for landscaping, detail elements, story, and overarching theme. I am, of course, talking about the restroom. 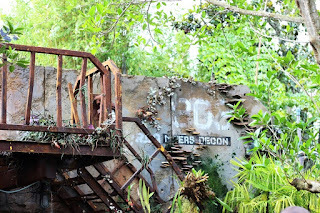 Specifically, I want to look at the restroom to the left of the walkway as you enter into Pandora from Discovery Island. What could be a nondescript plain building is layered to live in an alien environment, generations after conflict, made by foreign entities, yet still subscribing to the park’s overarching message. If you are going to build a bathroom that fits into all of these categories, you have to start back at the top. That means that the intrinsic value of nature comes above all, and that all of the manmade objects are secondary to the natural forms of the world. In other words, the design of the building has to either be celebrating something about nature or be succumbing to natural elements. In the case of the Pandora restroom, the natural world is very clearly reclaiming this building. 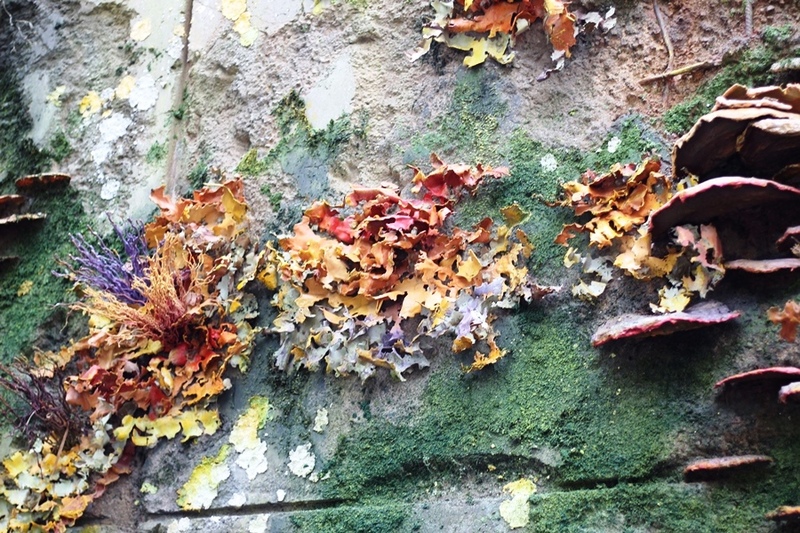 Moss and fungus have encapsulated most of the building and anything non-native around the facility. Stairs, walkways, and railings have rusted, some pieces have disintegrated while others are in the process of coming apart. Some sections of the wall have fallen down, while what remains is crumbling right before our eyes. 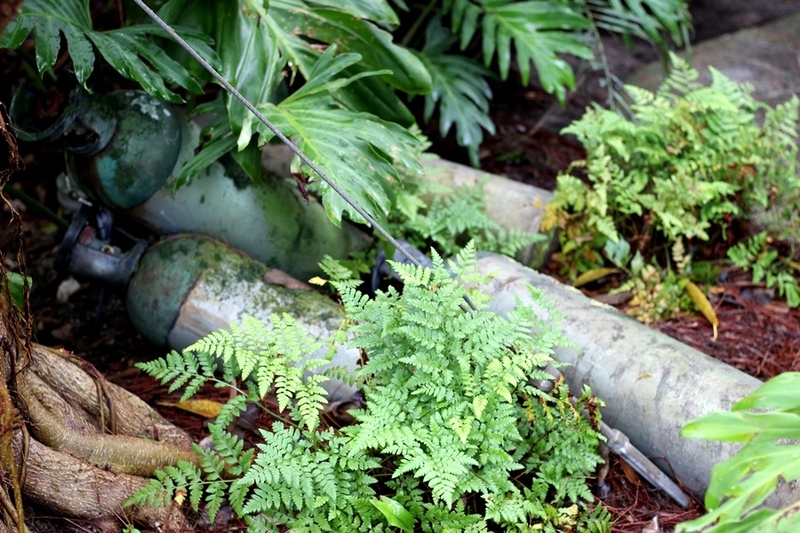 Even the tanks in the nearby shrubbery are half buried and covered with moss. 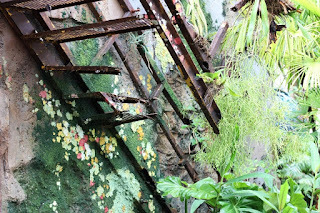 Where there are gaps in the metal and concrete, small plants have taken root and begun to spring up. Yet, even as this structure is succumbing to the environment, it adheres to both sides of our principle. The grey concrete slabs say nothing about the natural world and therefore are being reclaimed, but what is growing on the exterior of the restroom is incredibly beautiful and is a celebration of the natural world. Splashes of purple, orange, red, and blue thrive against a backdrop of green. Throughout all of Disney’s Animal Kingdom, there may not be a better example of paradoxically abiding by both sides of a theme’s rule than this building. 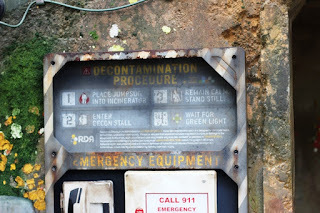 Within the confines of the story on Pandora, the building itself was once used as a decontamination facility for miners. In other words, it was used by miners stripping the moon of its resources to make sure none of the natural elements came through to their manmade compound. The irony of how diametrically opposed to the value of nature theme this is not lost on me. However, this also helps to establish the story of Pandora, where we are in the story’s timeline, and how nature itself has changed the layout of the land. Radiating out from the building is a variety of plant life. Traditional landscaping speaks to how man can define their environment. It is filled with angles and curves, specific numbers of plants equidistance from one another, and is meant to show off the beauty of the natural world while containing it within a neat and pretty box. By not allowing unbalance in the plant plan and variety, the idea of valuing the foliage is almost lost. In contrast, the plants that are around our restroom feel randomly placed, even those that are Imagineer crafted artifacts. This allows for guests to sense the wild nature of Pandora, both from a landscaping and a storytelling lens. Disney’s Animal Kingdom is, at its very heart, a park that celebrates that natural world and all of the plants and animals that reside here. Pandora allows guests to see the violent and beautiful sides of nature. It is a mirror of the world that surrounds us here, and it plays right into the park’s theme. If a story can be furthered by just the features of a restroom, imagine what the rest of the land can tell us if we truly look, listen, and feel.